Upholstery even more than carpets are sensitive to the cleaning solutions that are used. Most cleaners are still using detergent based chemicals or chemicals which have a high alkaline content and will normally need a second chemical as part of the rinsing process to neutralise the original detergent, meaning that chemicals are left in your upholstery. Here at The Rutland Cleaning Company we use only detergent free, pH neutral cleaning solutions that are rinsed out using only fresh water. They also work with a unique natural molecular action that eats away at soiling before being flushed out, leaving nothing in the fabric. 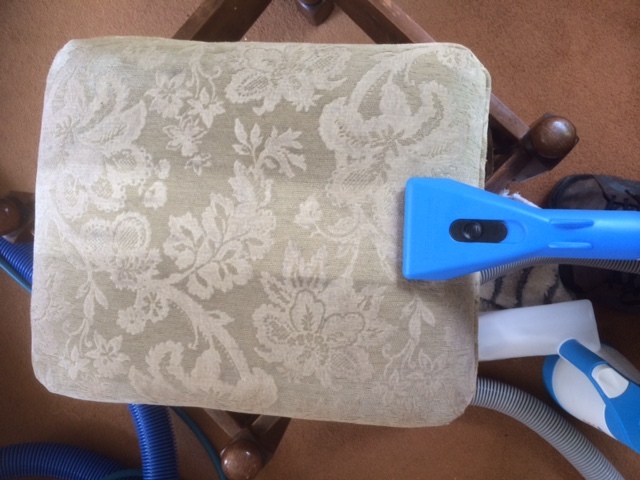 The photo shows the extraction process on a footstool after having a pre-spray of the cleaning solution and some light agitation to ensure all the fibres were exposed to the solution . The fabric is left only slightly damp and should be available to sit on the same day as being cleaned. Most suites have heavier soiling on the arms and on headrests on high backed designs, and we have specialist solutions to deal with such issues. Lots of people suggest they are upholstery cleaners but at The Rutland Cleaning Company we specialise in upholstery cleaning and can return your suite back to its former glory.